Senior middle blocker McKyla Brooks throws the ball in the air before serving in a game against UMBC in 2017. Sweeps were a trend for Stony Brook Volleyball at the Washington State Tournament, as the team was beaten in three sets by Illinois State on Friday, Sept. 7 and No. 23-ranked Washington State on Saturday, Sept. 8, but defeated McNeese State in three sets Friday night. The Illinois State Redbirds controlled the game’s tempo from the start and jumped out to a 13-5 lead in the first set. Stony Brook called two timeouts, but both were ineffective in stagnating the Redbirds frontcourt as they continued breaking down the Seawolves defense. The Redbirds went on a 6-2 run to conclude the set, winning 25-13. Stony Brook scored the first two points of the second set, but Illinois State responded with a 7-1 run to take an 8-4 lead. The Seawolves were diligent and battled back throughout the set, grasping a 20-19 lead on consecutive errors by Redbirds senior right side/outside hitter Lexi Varga. This was the last lead the Seawolves held in the match as the Redbirds capitalized on three-straight Seawolves attack errors to win the set, 25-20. Illinois State overwhelmed a Stony Brook defense that had no counter to the opposition’s aggressive attacking in the third set. Redbirds freshman middle blocker Marissa Stockman blasted a kill to take the 25-11 set victory and complete the three-set sweep. Stockman led her team with 11.5 points and was one of four Redbirds that scored 10 or more points, along with Varga, senior middle blocker Ali Line and junior outside hitter Ella Francis. Stony Brook engaged in a much tighter contest against the McNeese State Cowgirls, with neither team gaining a clear advantage in the first set. The Cowgirls looked to have pulled away with the set following a five-point run, but the Seawolves battled back to tie the game at 24-24. Stony Brook graduate outside hitter Emily Costello and freshman outside hitter Hailey Barden recorded consecutive kills to complete the comeback and take the set, 26-24. A revitalized Stony Brook offense remained persistent in finding holes in the McNeese State defense throughout the second set. Junior defensive specialist Kardasia Hitchcock rocketed a shot between the Cowgirls backcourt to give the Seawolves a 6-5 lead. The Seawolves retained the lead and eventually won off the Cowgirls’ 11th error in the set, taking it 25-17. The teams competed in an evenly-contested third set, with neither gaining a lead larger than four points. The Cowgirls cut their deficit to one point, but senior middle blocker McKyla Brooks shut down the comeback attempt with her eighth kill of the game, giving the Seawolves the lead for good. Stony Brook would go on to win the set 25-21 and sweep McNeese State. Brooks’ kill was the 1000th of her career, making her the 11th Stony Brook player to record this feat. The senior trails middle blocker Evann Slaughter, who finished with 1,024 career kills. Head coach Kristin Belzung congratulated the veteran leader on her accomplishment following the victory. Stony Brook competed well against the No. 23-ranked Washington State Cougars, forcing six ties throughout the first set. The Seawolves could not match the Cougars’ aggressive attacking strategy and fell behind 13-11 off consecutive Seawolves errors. Washington State finished the set with three straight kills and earned a 25-18 victory. Stony Brook’s offensive and defensive struggles started to become apparent in the second set as five errors contributed to Washington State jumping out to a 14-6 lead. 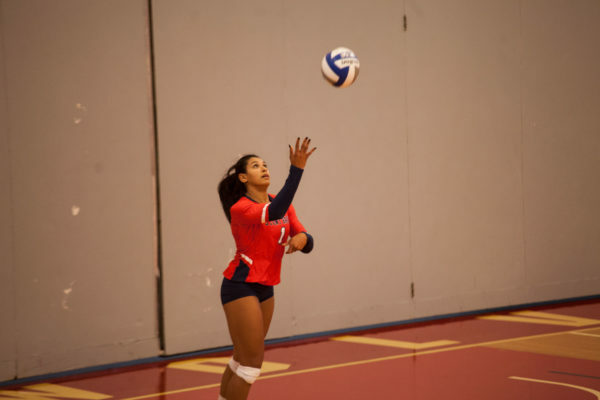 The Seawolves struggled to record kills and finished the set with an alarming .000 hitting percentage and .161 kill percentage, compared to the Cougars’ .394 hitting and .455 kills percentages. Washington State cruised to a set victory, winning 25-13. The Seawolves offense fared better in the third set as a kill by junior setter LeAnne Sakowicz tied the set at 10-10. The kill was the closest Stony Brook got to winning, as Washington State closed out the final set with a 15-6 run to take a 25-16 victory, handing the Seawolves their second sweep-loss of the tournament. The Seawolves will return home to host their final tournament this season, the Stony Brook Invite hosted by Holiday Inn Express. Belzung reflected on being able to compete in front of the home crowd again after playing 10 of their 11 games away to begin the season. The Seawolves will begin on Friday, Sept. 14 by facing Bryant in the Pritchard Gymnasium at 6:30 p.m.